Opublikowane 11/06/12 o godz.19:01 w kategorii English. On June 8, the Euro Cup opened in Warsaw. The city was full of police, military police and football fans. 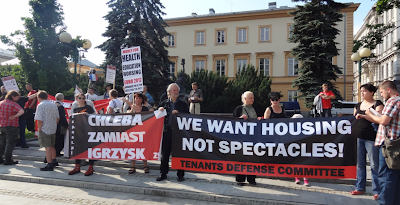 ZSP and the Tenants Defense Committee organized a protest against the politics of the Euro. The protest was at the main roundabout on the way to the stadium, so thousands of people passed by. People spoke about the money spent on the Euro and the fact that UEFA (which was exempted from tax in Poland) and a few businesses would be big beneficiaries, but that the public has spent already almost 26 billion euros on the spectacle and working people are footing the bill. At the same time that Poland is spending a lot of money on games, children will go hungry as the city privatizes school cafeterias, makes cut in social services and raises the price on everything. 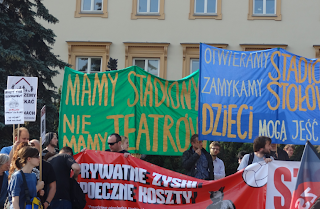 Someone from ZSP also pointed out that the general contractor which built the National Stadium in Warsaw declared bankruptcy earlier in the week because of problems receiving payments. This means that a whole line of subcontractors and workers have also not been paid. They threatened to block the opening of the Euro, but didn’t. The workers at the stadium for the Euro, who are being cheated and receive less money than promised, threatened to strike – but didn’t. This sort of situation, where many workers are not organized and are beaten with defeatism in a country with concillatory unions, is creating more and more social problems. The protestors called on people to organize themselves against these types of abuse. A guillotine was brought and the demonstrators declared that if the politicians continue as they are going, they might have to use it. Instead of more social cuts, the only thing we want cut are the heads of the government.